The Sierra Madre Mountains of Northern Mexico are vast, rugged and beautiful. Ironically, that same beauty belies the underlying suffering of the region's inhabitants. 90,000 Tarahumara, 20,000 Tepejuan, 5,000 Pima and 5,000 Guarajillo Indians occupy the valleys and plateaus of an area comprising the largest canyon system in the Western Hemisphere. The people of this region are subsistence farmers plagued with drought, poor soils and inadequate agricultural techniques. Their economic opportunities are few. Their greatest natural resource, the vast forests of the Sierra Madre, is being systematically overtimbered with little of the profits returning to the traditional inhabitants of the region.The Sierra Madre is the largest drug growing region in North America. Marijuana and opium are grown in the hidden reaches of the formidable canyon system. Lack of other economic opportunities drives many of the Indians into the illegal drug trade. There is a special place in God’s heart for “people groups”; that is, individual ethnic groups defined by their language and culture. There are over 7,000 people groups in the world each precious in God’s sight - many of which have never heard the name of Jesus Christ. 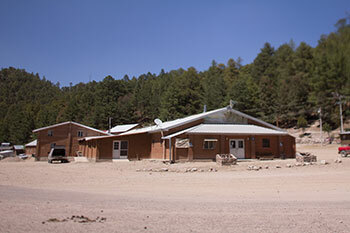 Hospital Misión Tarahumara is located in Samachique, Chihuahua in the heart of the Sierra Madre Mountains. It serves as Mexico Medical Missions' primary medical center and includes outpatient facilities, a dental suite, adult and pediatric medical wards, a lab, X-ray services and a modern surgical suite. The hospital is staffed by 40 physicians, nurses and support personnel. It provides a high level of sophisticated healthcare to an area that previously struggled without it. Contaminated water is the major cause of infant mortality worldwide. Mexico Medical Missions operates a well drilling program providing clean water to the communities of the Sierra Madre. Using a "DeepRock" portable drilling rig, we are able to drill deep wells in the predominately granite rock formations of the Sierra Madre. In a region where potable water is amazingly scarce, this much-needed program has brought safe drinking water to the people of the Sierra Madre. Among our partners is Hope Springs Water which helps fund our well drilling efforts. Visit them at www.hopespringswater.org for more information. 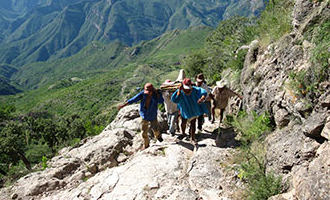 The Pamachi Clinic and Chique school are located in isolated communities perched high on the edge of the Urique Canyon in the heart of the rugged Copper Canyon region. Jacob Sotelo and his Community Health Evangelism team work in these communities. The Chique school was built by Mexico Medical Missions and presently has 20 students, most of whom travel hours on foot to attend the school. 2016 will see the opening of the dormitory which will house these students who presently sleep on the floor of the classroom. 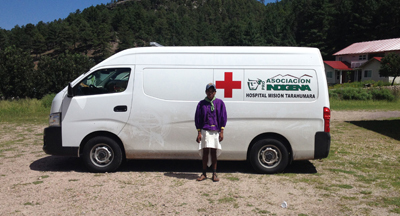 Due to the rugged terrain and isolation of the hospital, Mexico Medical Missions maintains two ambulances and several off road vehicles to transport ill and injured patients from remote villages to Hospital Misión Tarahumara, as well as to move critically ill patients to tertiary referral hospitals when necessary.